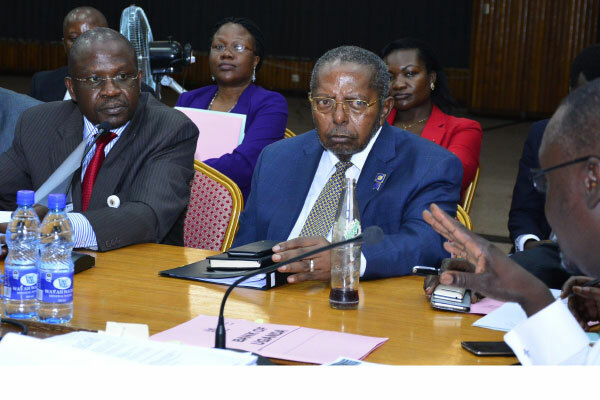 PARLIAMENT– Legislators on the Committee of Commissions, Statutory Authorities and State Enterprises (COSASE) have told off some members of Bank of Uganda’s legal team that Parliament isn’t interested in their legal opinion on how to conduct investigations into how seven defunct banks were closed. The warning was made by COSASE Chairperson, Abdu Katuntu who was responding to a letter written by Titus Mulindwa Acting Legal Counsel, pointing out that the Committee is uncomfortable with individual members writing to it, and demanded all information to be passed through the Governor or the Central Bank Secretary. He made the remarks this morning while interfacing with the Central Bank officials who are probing findings in the audit report which pinned the Central Bank on the controversial closure and sale of commercial banks since 1993. Katuntu pointed out a case between rebel MPs and the Attorney General saying the matter of legal opinion was settled by the Supreme Court with the Court holding that Parliament is independent and isn’t bound by the decision, opinion of the High Court. The COSASE Chairperson also didn’t hide the fact that he was in total disagreement with the legal opinion and went ahead to read before the Committee contents of Mulindwa’s letter. He added that the opinion itself has many problems because it sort of insinuates that Bank of Uganda can hide information from Parliament. “This institution is the representative of the sovereign, the people of this country we act in accordance of the law, not what people think of us. We are going to treat this legal opinion, not with so much weight. It will remain where it has ended, though I have asked the legal department of Parliament to write back to the legal counsel,” Katuntu said.